It's your Society, so let us know what you think. Polls give rapid feedback on what the membership thinks about topical issues. If you have a burning issue you would like to poll the membership on please raise it in the Forum and if there's interest, we'll poll the membership here. 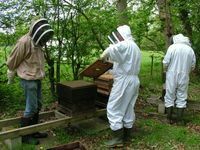 Which varroa treatment did you use this autumn? Anecdotally there seems to have been a big switch to recently licensed MAQS beehive strips. What did you do, stick to the tried and tested or get your bees in a tizz with this new new formulation of formic acid? You can see the outcome of the poll by clicking 'View results'. Want to make a comment or view what others have said? - Just click on 'Comments'.